The WAGNER GM 4700AC is a best in class Air Assist Airless Spray Gun with features that set it apart from the competition. It is part of the Wagner AirCoat family of spray guns that are engineered for long-lasting and efficient operation. The GM 4700AC Air Assist Airless spray gun is optimized for any job where large scale coverage is concerned. A 93% transfer efficiency rating also ensures that most of your material gets utilized and doesn’t dissipate into the air. Typical applications include spraying lacquers for wood finishing, coating 2k materials for corrosion protection, and any general coating job in the metal and wood industries. 1) Best In Class Atomization: The air cap for the AirCoat family of Air Assist Airless spray guns has been fully re-engineered to provide a softer and smoother spray pattern. Due to the new design, the material pressure is reduced and spray pattern is much more consistent than the competition. 2) Extreme Transfer Effcicency: A transfer efficiency rating of up to 93%, typically unheard of for air assist airless, is what the GM 4700AC can deliver. This is due to the fine atomization and consistent particle size. 3) Tool Free Filter Change: A brand new (patent pending) filter design significantly reduces downtime and makes your life easier. Simply un-thread the filter housing and the filter pops right out. There is no faster, or easier, filter change for an air assist airless spray gun on the market today. 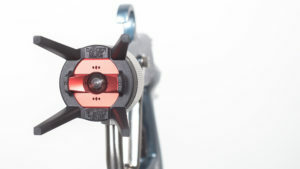 4) Fan Air Adjustment: Adjust the fan air to customize your spray pattern, from wide to small, with an easy to reach knob right on the gun itself. 5) Fatigue Free Operation: The GM 4700AC is the lightest air assist airless spray gun on the market today that features a tool-free exchangeable cage filter. 6) Designed for Comfort: Designed from the ground-up with ergonomics and comfort in mind, Wagner AirCoat spray guns feature different sizes and an easy-to-operate trigger. This ensure the optimal comfort of the operator. Call us to get a quote or for technical support.